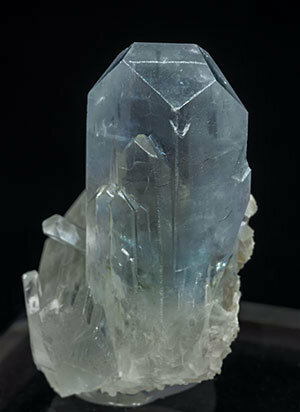 A group of Celestine crystals, one of them clearly dominant, with very sharp faces, clear, bright and with a uniform light blue color. 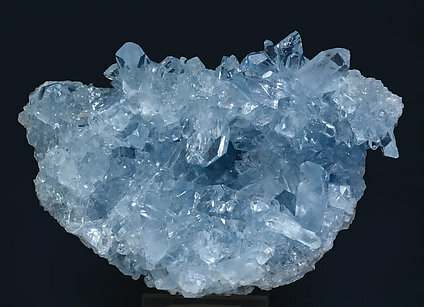 Druse of Celestine crystals very rich in faces that are very well defined with sharp edges, extraordinarily transparent and bright and with an intense sky blue color. Of a great quality for Madagascar. Druse of crystals, between translucent and transparent, with very well defined faces and edges and a very deep blue color. It is from an old find in the sixties of the last century. Esthetic growth of two groups of elongated radiating prismatic crystals with very acute terminations. 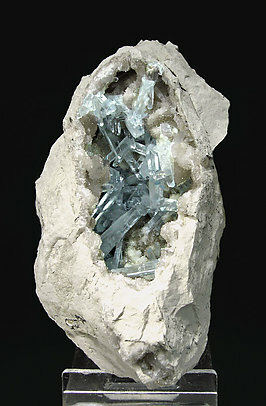 The crystals, bright and of uniform clear sky blue color, are on a small matrix. 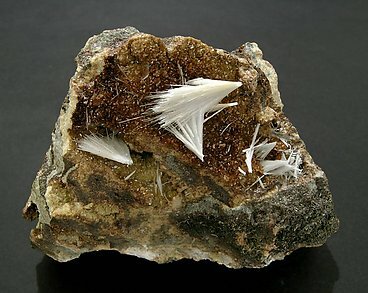 Enhanced bundle growths, very delicate and esthetical, of very thin acicular crystals, snowy white, contrasting with a base of little brown rhombohedral crystals of Siderite. 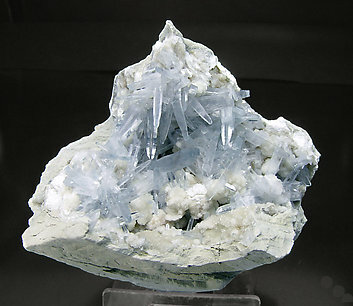 Vug of sword-shaped Celestine crystals, with excellent luster and sky-blue color, coated by small white creamy hedgehoglike Calcite crystals. The specimen is a recent and exceptional find in the same locality as old findings, in Torà, but the new specimen’s quality is much better. 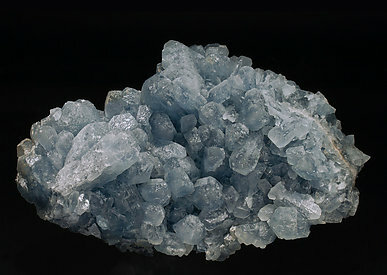 Lance-like crystals of Celestine that have excellent luster and sky blue color. They are in a geode upholstered by small "hedgehogs" of white crystals of Calcite. The sample is from a 2007 find. 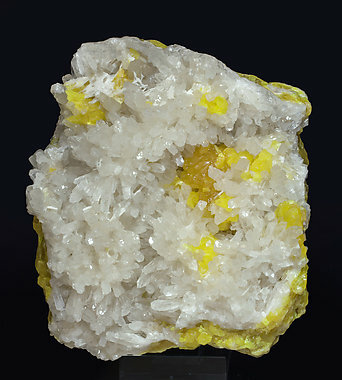 Druse of translucent and bright crystals with parallel and polycrystalline growths. 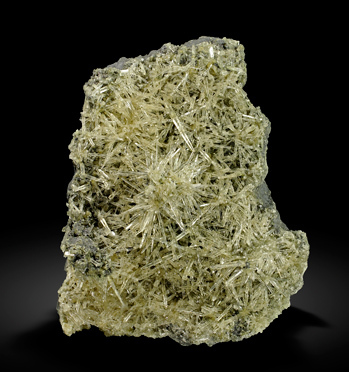 They are on a matrix of volcanic tuff with native Sulfur crystals. An excellent Italian classic. 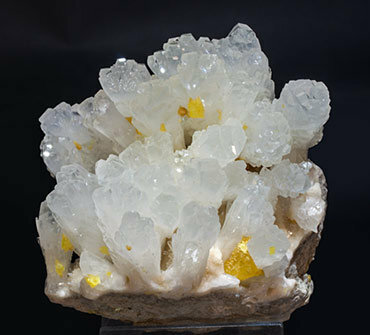 Celestine crystals with a prismatic shape, with good terminations, translucent, bright, with a snowy white color and implanted on a group of Sulfur crystals on matrix. An excellent Italian classic that is from the Carles Manresa collection whose label we will send to the buyer. 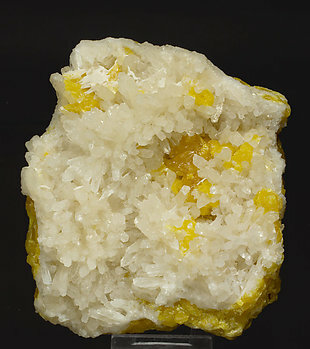 Druse of prismatic crystals with very well defined terminal faces. 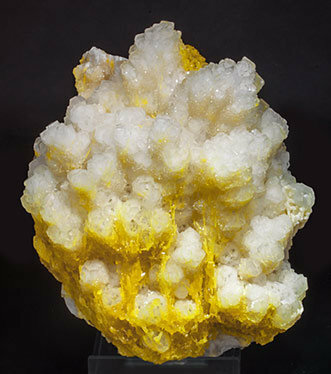 They are white, very bright and partially coated by skeletal native Sulfur crystals. 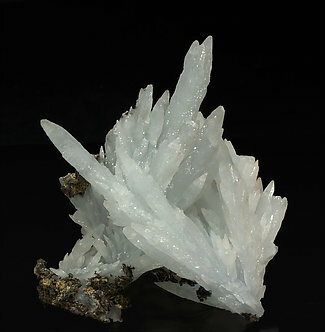 Groups of elongated crystals of Celestine with a snowy white color, very bright and with completely transparent areas. They are on a matrix of Sulfur. 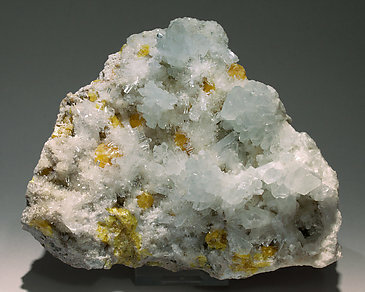 Two generations of Celestine aggregates, the first one with bright, translucent slightly blue crystals, and the later with smaller fine crystals, absolutely transparent, colorless and extraordinarily bright. They are on matrix, with native Sulfur. A Sicilian classic. 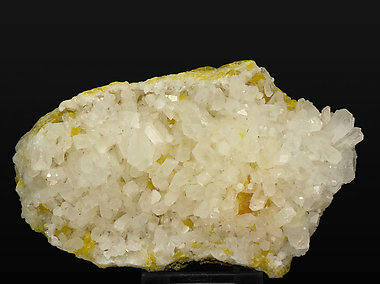 Group of white prismatic crystals with very well defined faces and edges on a matrix of Sulfur. An Italian classic. 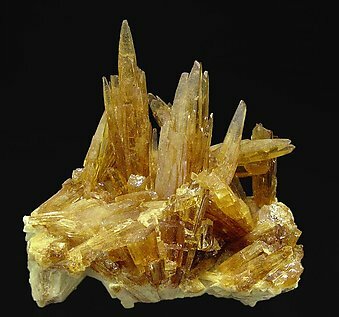 Very transparent and bright honey-colored elongated prismatic crystals of Celestine with curvatures and acute terminations and on a base very rich in native Sulfur. The piece is not perfect, having some broken crystals, but its esthetics are very good.